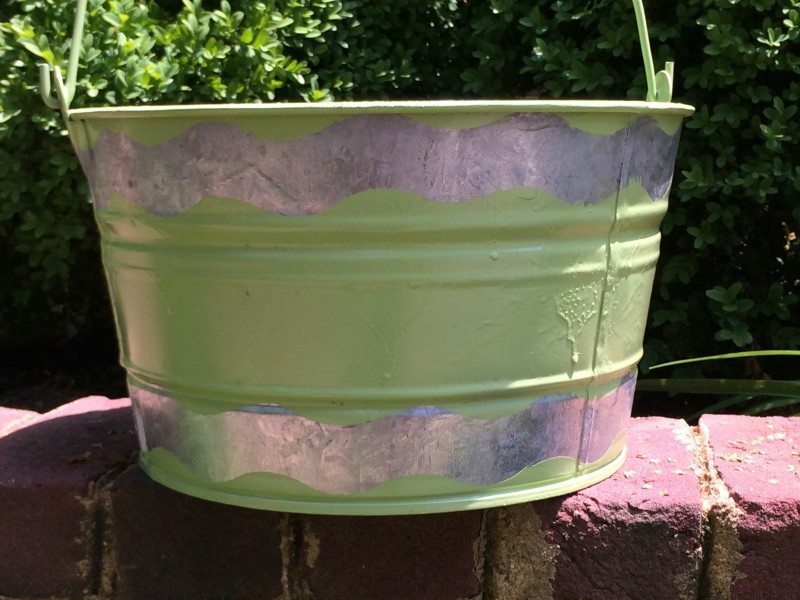 This post about a Make a Custom Pet Food Container Out of A Old Popcorn Tin is brought to you by FrogTape Brand Painter’s Tape. All opinions are 100% mine. What do you use to store your pet’s food? For the last 2 1/2 years we have used an empty popcorn tin we received as a gift. 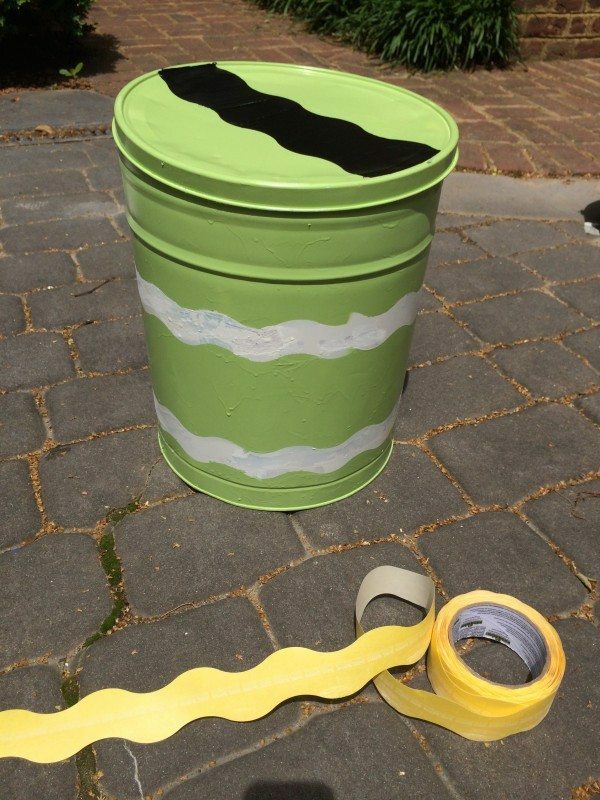 After given the opportunity to try FrogTape® Shape tape, I decided to give this tin can a makeover. 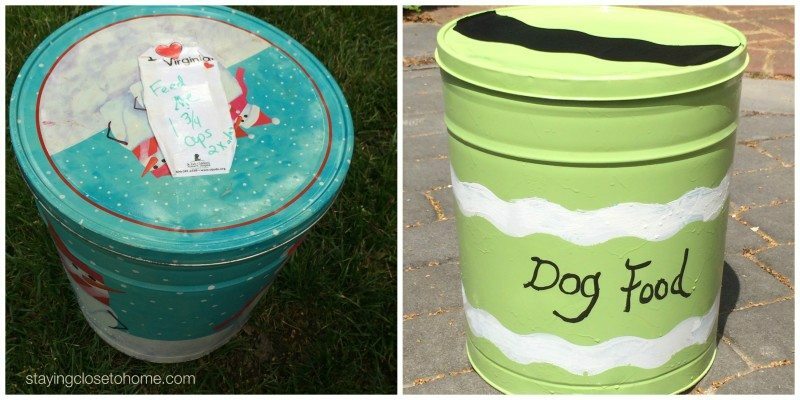 My FrogTape how-to inspiration comes from this designer dog food container found on Ballard Designs. I love my pup but not enough to spend $80 for a container when I have a similar food storage container at home, it is just not as pretty. 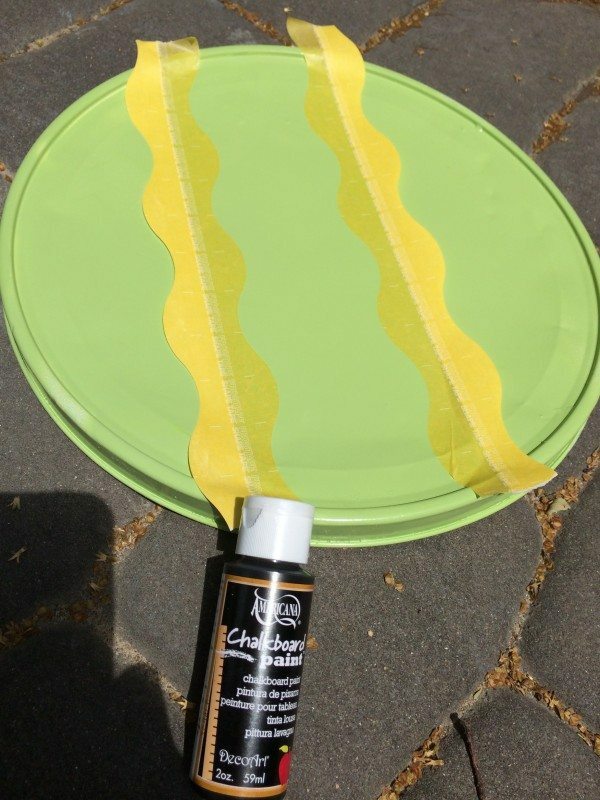 I am going to show you how easy it is to transform an ordinary tin pail into a designer pet food container using FrogTape® Shape tape, specifically this wave variety. 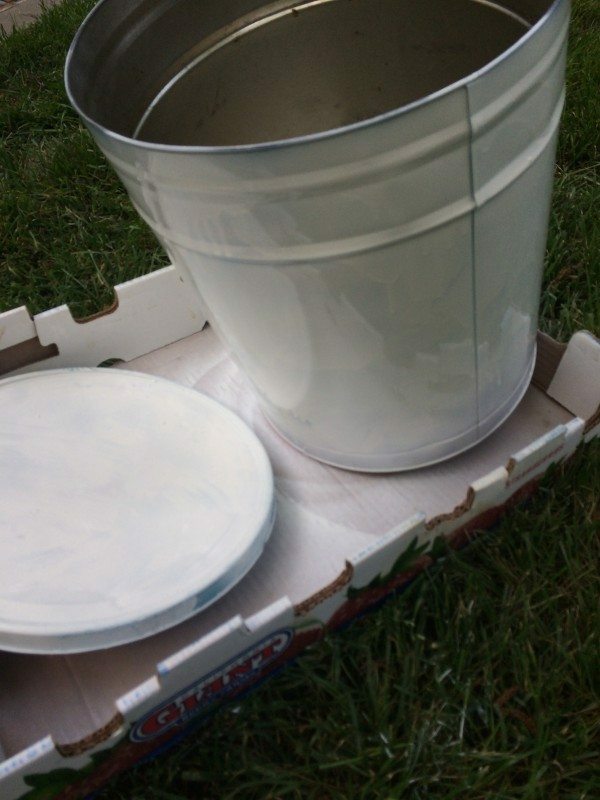 After the paint is cured, apply the Shape tape around the container. The directions suggest taking one side on then pulling the other side. Since this is in a circle, I found that to be challenging. When I applied the second strip, I took off both sides at once and then applied it to the pet food container. 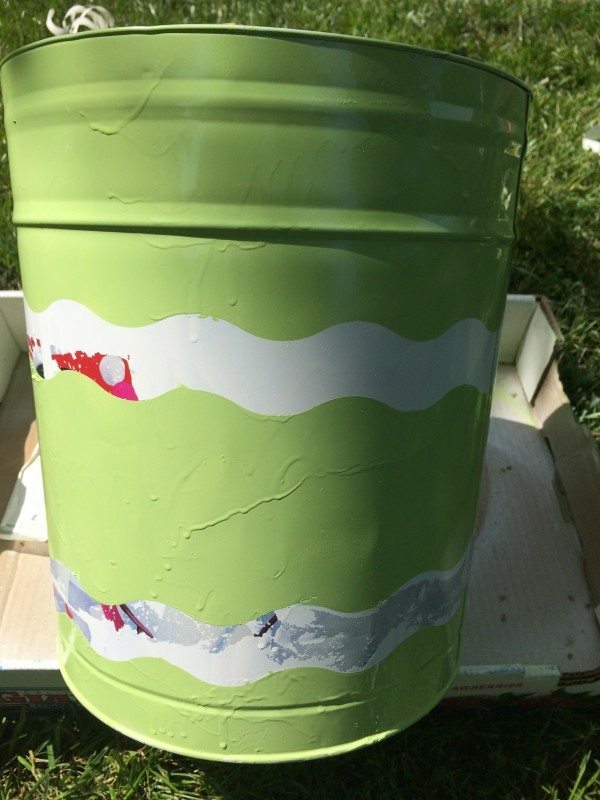 Once it is sealed, you can spray the entire container again with spray paint, this time I chose a green color. You can immediately remove the FrogTape if you wish. I had no problem with the tape pulling up the other paint on the lid of the container since I allowed it to dry for a few days. Since I only waited for the paint to dry, a few hours, the tape pulled up a little of the white paint. I have learned for my next project. Here is it after I fixed it. Don’t ask, just allow the spray paint to cure for at least 24 hours, I would suggest 48 at a minimum. 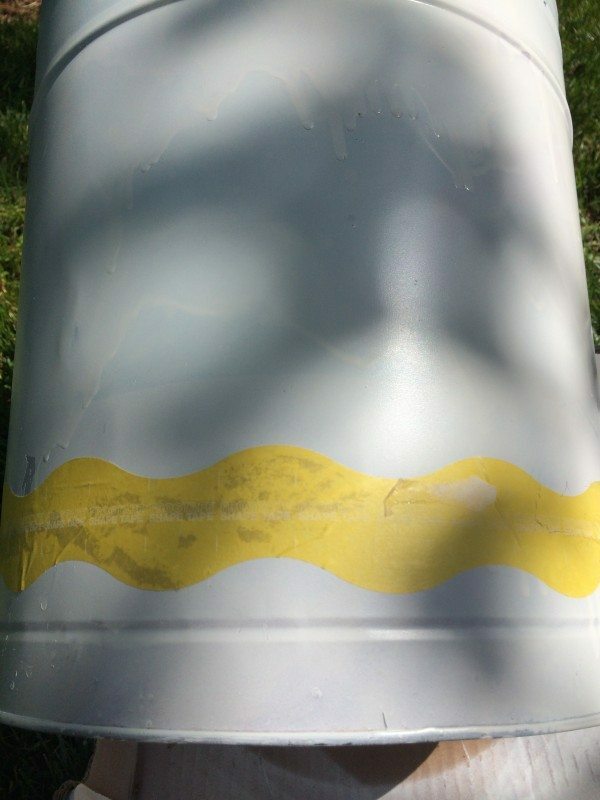 The FrogTape really does lock away the paint and gives great lines, even these curvy ones. Since Chloe’s Food amounts have changed with age, weight and type of food, I decided to add a chalkboard strip on the lid. 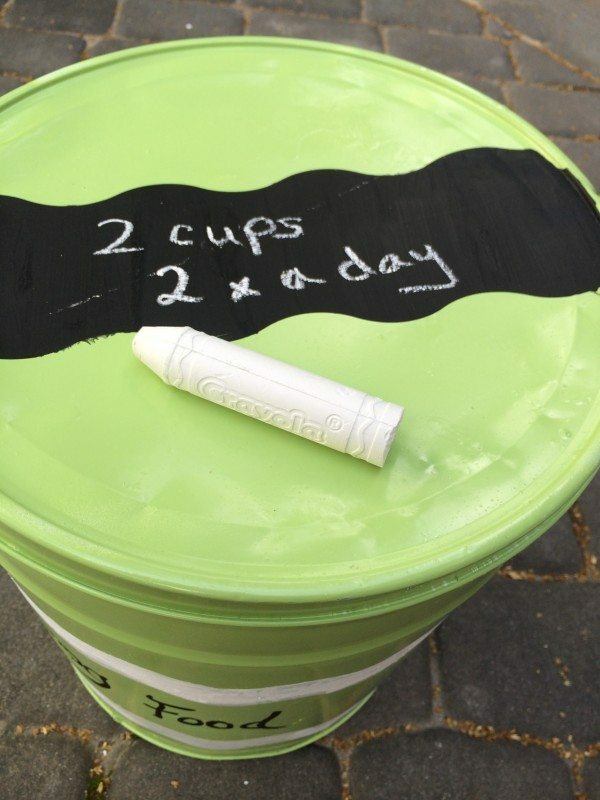 Simply tape off the space you would like to have as a chalkboard. This is the perfect dog food storage solution for a very low price. Paint on the chalkboard paint per the directions. 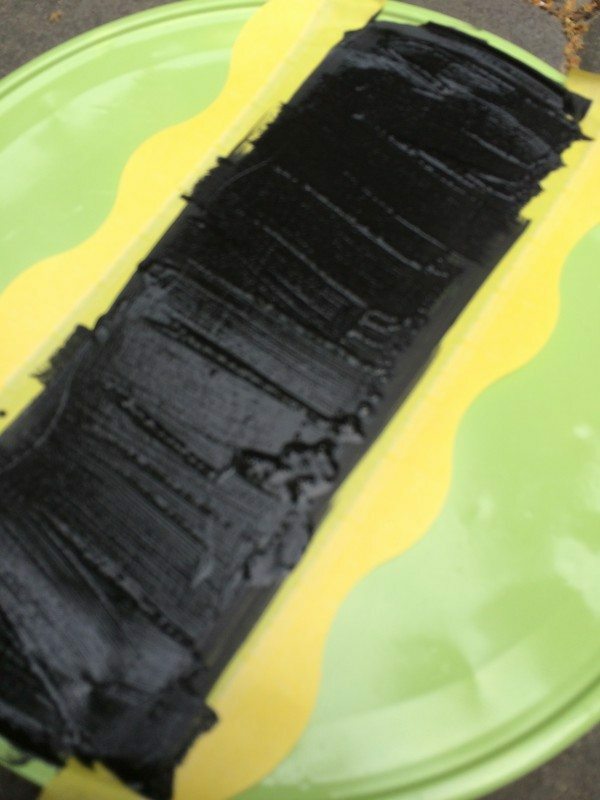 Lift off the tape and allow the chalkboard paint to dry completely. Now you have a customized DIY pet food container that looks like the designer version but was much less expensive. 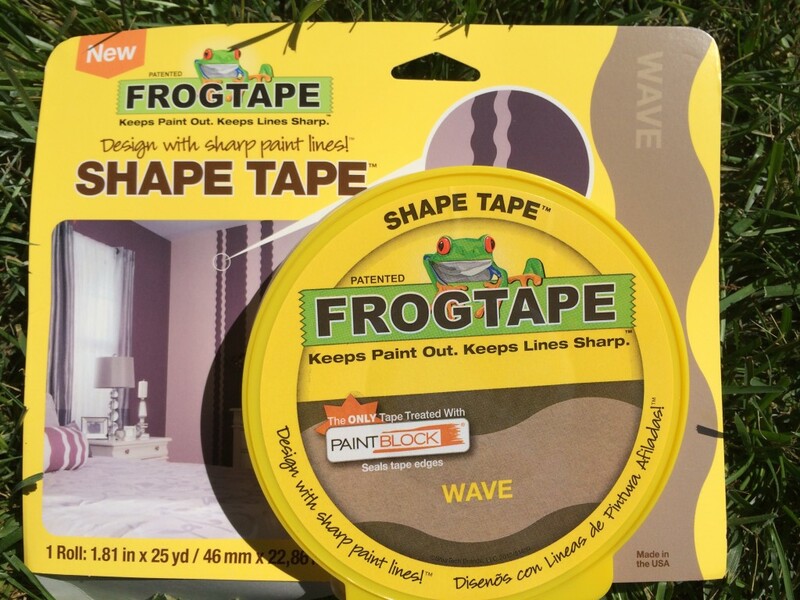 Now what to make next with my FrogTape® Shape tape!! 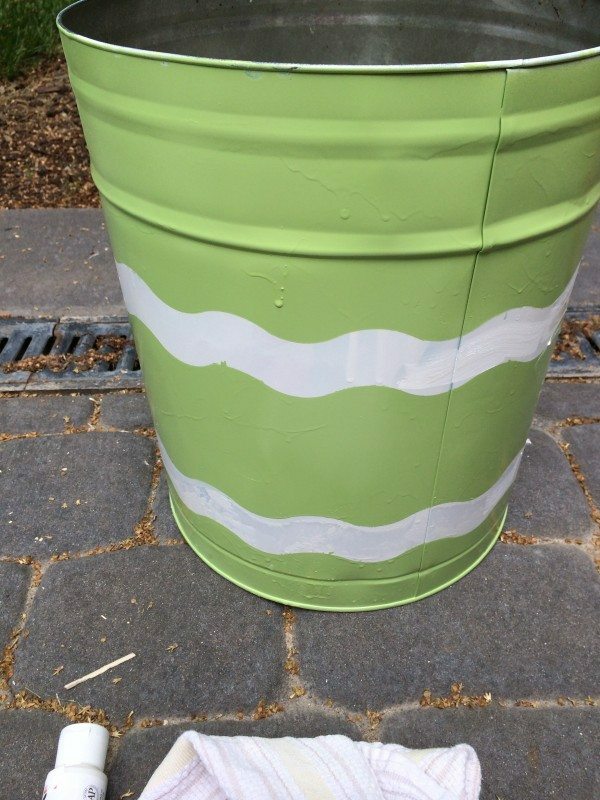 Ok did not take long, transformed this yucky pail I found, and will use it as a drink tub for outdoor parties. What will you make with FrogTape? See what others are doing by following them on Twitter. Would you make this a Custom Pet Food Container? Ours has lasted for several years. Very cute idea! So true, right? Pet toys and supplies can be pricey. I just love this…dropping by from friday frenzy. Have a great day. A great idea for alk types of storage. Never thought about spraying anything and using frogtape. Thanks for the idea. It’s really turned something ordinary into something quite nice! Now you can even sport this in your house, not just for pet food! how cute! i love the wavy lines and wouldn’t have thought of that – I’ll have to check this tape out and maybe try it on some glass! Cute idea for jazzing up that bucket! I think I’d use it to hold my daughter’s duck tape rolls! Love to see your flower pot Wendy and yes that would be a fun project, thanks for the inspiration. A teachers gift might just be in order. Love to see what you come up with if you do move forward on this project! This is such a creative project idea. I am going to share this with my kids to see if they would like to do it for our pets. That’s awesome, how fun! My kids always ask how much to give the cats, I think they’re stalling. If I could write it on the container I’d be happy but even better? Make a SUPER CUTE container! What great ideas. Especially if you are going out of town and someone needs to feed your furry babies. I am getting so many ideas I want to do with this tape now. Oh how neat. I love the wavy design. I could transform quite a few things with that frog tape! That is awesome, I have never heard of frog tape! Love the design, came out cute! I have seen pet food container like this at the store before, but never bought one because of the price. The one you made is just as cute but so much cheaper! I love it. 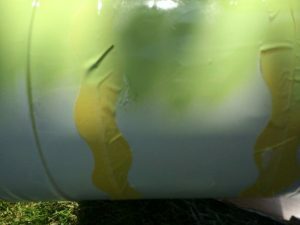 I hadn’t a clue about frog tape until I read this post. I think I need some frog tape now. Cute project! Can’t wait to see what you would come up with Liz. Thanks Lisa, it was about time I updated her petfood container. That is very creative way to reuse and recycle. Love it. What A Awesome Idea I Must Do For My Pets Thank You Came Out Very Nice!! That came out SO good. I love that it’s so easy to do, too!!! What a great idea! So cute and easy – and practical!